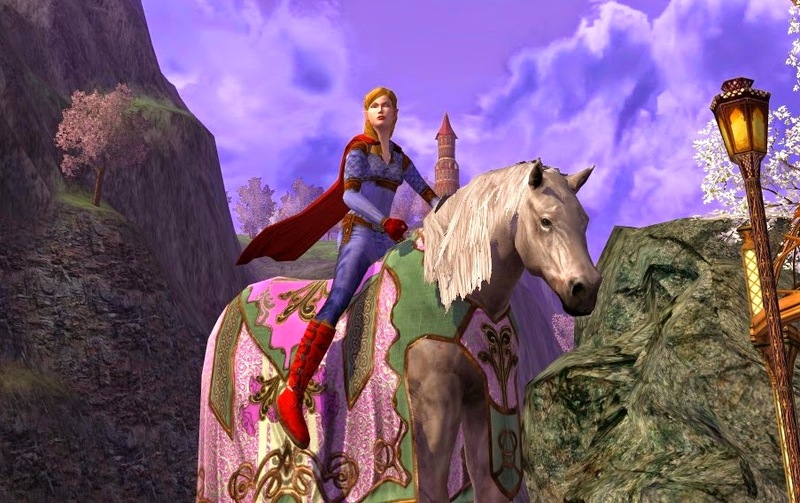 Supergirl of Lorien: Steed of Spring Gardens and pet Shrews! 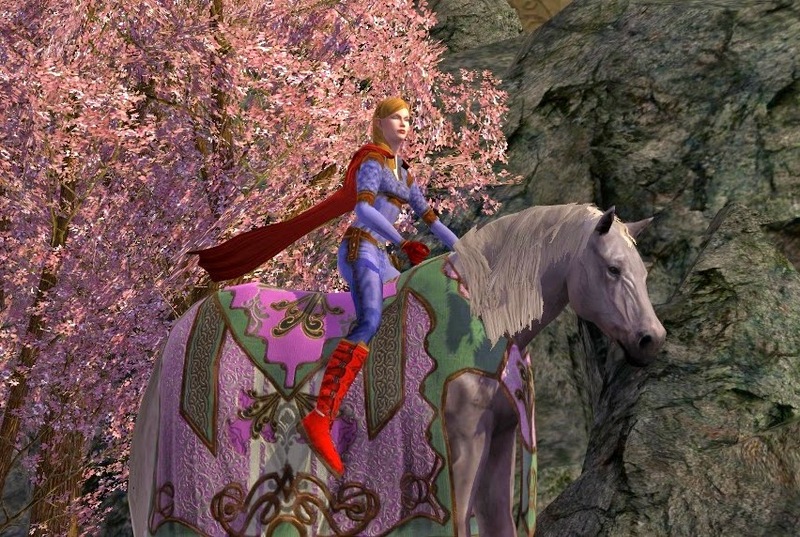 Steed of Spring Gardens and pet Shrews! Oh-ho! 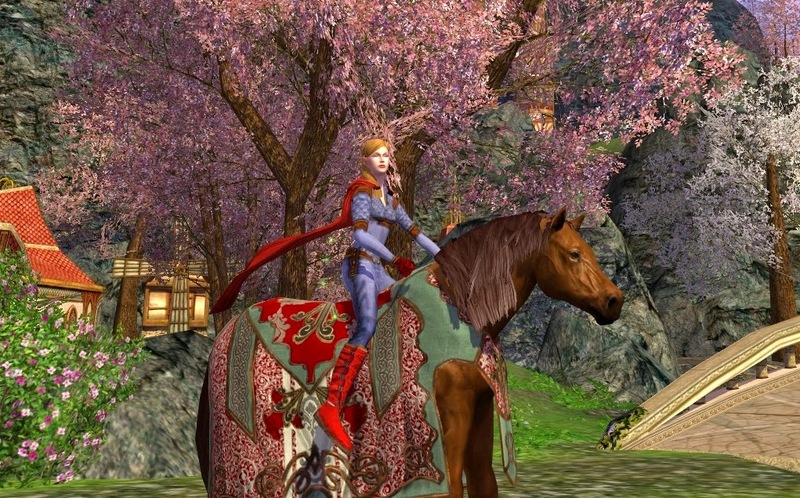 2014 and another Spring Festival cometh! Spring Festival holds a dear place for me because it was the first event that was in progress when I arrived in Celondim those many years ago. At the time, I was such a noob; I had amassed 7 Spring Leaves for barter and had no idea how one could earn so many. I didn't realize that the quests were so repeatable and I could come back the next day and do them again! Live and learn. This year's festival has many of the things that were available at previous spring festivals. The new things for this year's festival include 3 new cosmetic outfits, the new horse and warsteed cosmetic, and pet Shrews! Oh yes, pets are in vogue apparently now, lol! There is one huorn from Fangorn (which I haven't gotten yet because I have been festivalling since Fangorn was released), 6 chicken from Hobnanigan's (hobnanigans-fun), and now 4 shrews from this Spring Festival. Shrew Pets: I'm still working on getting all of the shrews. They are random rewards. (1) The Spotted Shrew is a random drop from Flower Patch nodes while doing the Flower Quest, (2) The Plain Shrew is a random reward from the Shrew Quest, (3) The Dusty Shrew is a random reward from the Maze tweens Quest, and (4) The Large Shrew is a random reward from the Enormous Shrew Quest. As you may have read from me before, I am not a fan of random rewards. On the bright side, the rewards are "Tomes" that can be traded, so you can trade/sell/buy Shrew Tomes you want/don't want. I would guess that the Spotted Shrew is the easiest to obtain since you have several hundred chances at picking up Flower Patch nodes within the hour long quest, and the other quests are once/9 minutes, once/day, and once/9-min-if-you-win-enormous-quest. I neglected to take a picture of the two shrews I've gotten so far, so Danaish shows off her Spotted Shrew here. He looks very happy that Danaish always carries food on-hand. 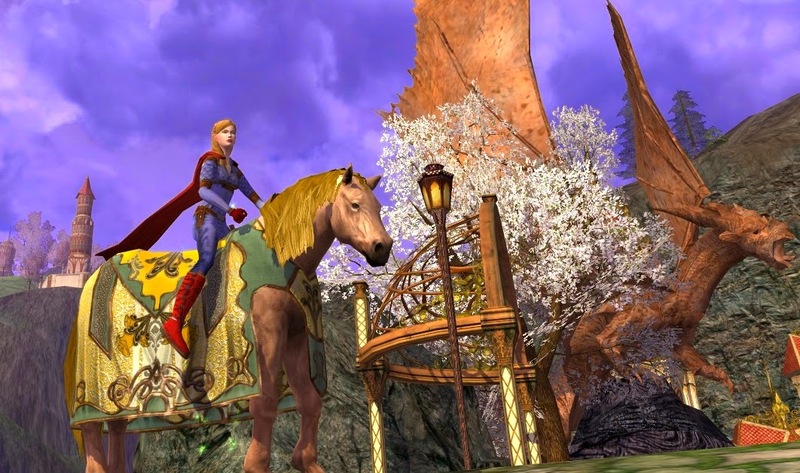 Steed of Spring Gardens: Horse time! 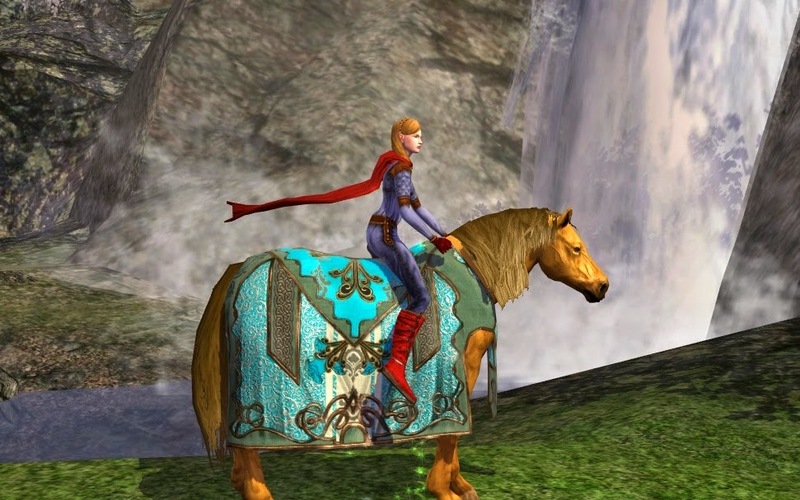 The horse costs 40 Spring Leaves. It is very easy to barter with a little time at the Shrew stomping area. 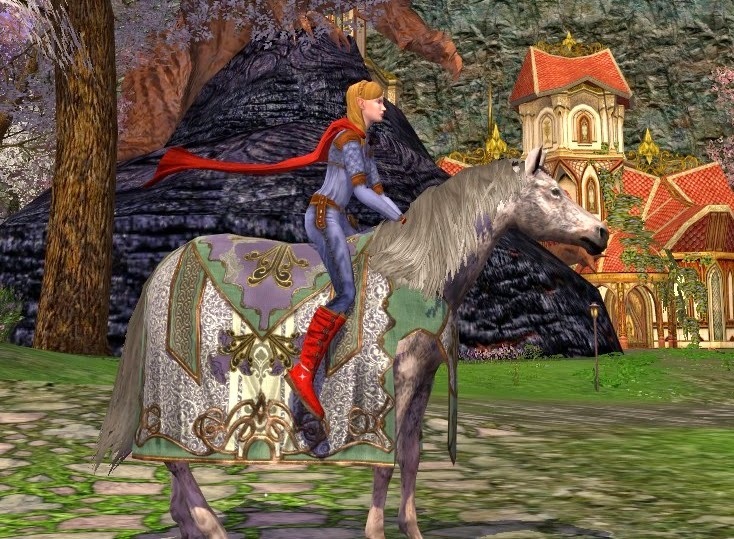 The horse for the 2014 Spring Festival is called the Steed of Spring Gardens. Good name. Here he is. He is a pretty dapple grey pattern. 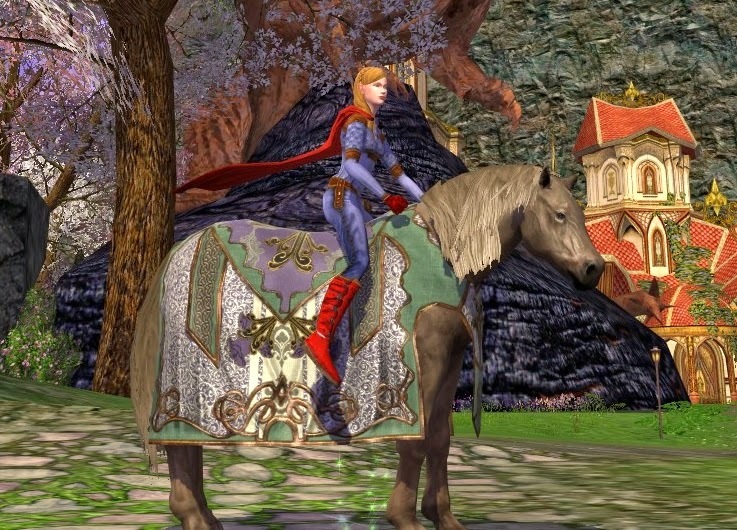 Warsteed of Spring Gardens (aka Trellis-weave) - Default: Breaking with tradition of naming the warsteed cosmetic similar to the actual horse, this spring's warsteed cosmetic is called "Trellis-weave". Yes, this is the one that looks like the horse. The one-piece Trellis-weave Caparison is very very easy to barter at only 20 Spring Leaves. Here it is in Default colors. The Trellis-weave dyes very well so take your pick on which color you like. Here is Crimson with a few browns for the horse. Here is another look with lighter colors. Oooh. Ok, yes, the Draigoch statue offset the picture nicely, but I do like the gold and sorrel and the seal brown hair which looks very golden! Thanks Gloredh! Nice, sea blue and white looks sharp! I wondered why some of the shrews seemed rather unbalanced in the AH. I'd just assumed they all dropped from the Stomp-A-Shrew quest reward boxes. Spotted Shrew is certainly the cheapest. I just hope no one summons when while doing Stomp-A-Shrew. It was really annoying when players summoned chickens in Hobnanigans. I noticed they changed the maze design. The speed runs are now slightly easier, and finding lost elves is a lot harder... And those new Bullroarer runs, I don't think I'm ever going to finish those. At least Spring Leaves are easy to farm. Comparing the 'Steed of the Spring Gardens' and 'Trellis-weave warsteed (spring) - Default' pictures to the 'Trellis-weave warsteed - Gold, sorrel, seal brown' picture, I hadn't realised just how large a Draigoch Statue is. 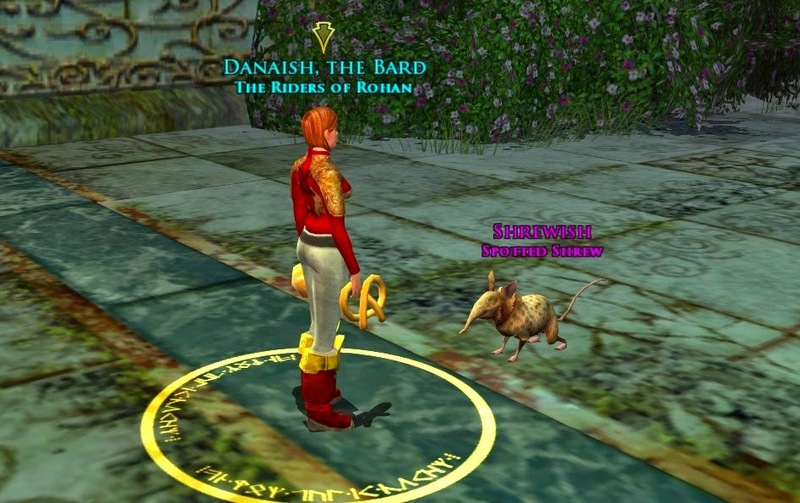 there are 4 shrews, spotted is from flower patches repeatable in bree, large shrew is rare from stomp enoromous shrew, one shrew is from maze quest with tweens, and another one is from elite gardner quest in stomp a shrew.